Sunshine, Bighorn Sheep, snow-kissed mountains, and a fun road-trip partner made for a pleasant four hour drive up to the iconic Jasper Park Lodge. Christmas in November is an event I have wanted to check off my culinary bucket list for quite some time, and saying I was excited to attend this year is a bit of an understatement. What exactly is Christmas in November? 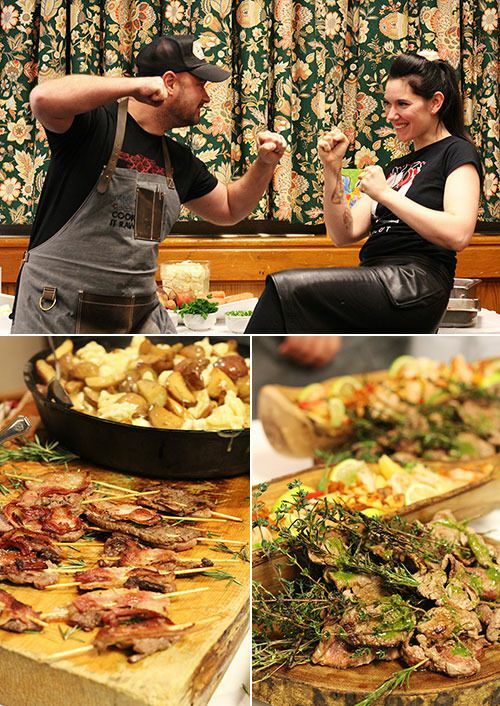 It's a 3 day, 3 night culinary adventure that takes place at the Fairmont Jasper Park Lodge where you learn, mingle with celebrity chefs and industry experts and indulge in all things food. It's practically an all-inclusive culinary vacation, hosted in the beautiful rocky mountains, so it's worth your while if you love food and preparing for the holiday season. For the 27th annual event, I attended on behalf of Gastropost. You may recognize Gastropost from your local newspaper in Edmonton, Calgary, Vancouver or Toronto - they post food missions for food lovers to complete, and the photos can be featured in the weekly section in the newspaper. It's a fun way to share your food photography and connect with local food lovers in a unique manner. 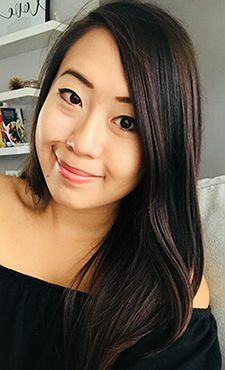 As the Gastropost ambassador my mission was to tweet, Instagram, blog, and submerse myself in all things food - it was a blast and I would happily do it all over again! At Christmas in November there are three packages you can choose from. The first runs from Friday evening to Monday morning, the mid-week package spans Monday evening to Thursday morning, and the final package runs Thursday evening to Sunday morning. My boyfriend and I attended the mid-week package, which we felt was perfect for our introduction to this extravagant event. On the first night we attended the welcome reception, where guests were invited to don their silliest Christmas sweaters. 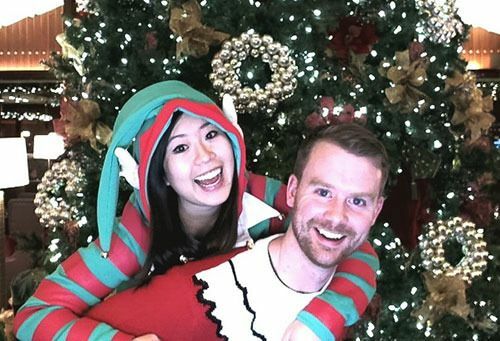 We had fun dressing for the occasion, with G dressed in his Santa sweater and myself in my elf sweater (which was complete with jingling bells, a hat, and ears!). And although we didn't win the prize for ugliest sweaters, we definitely conquered the buffet. Like many others I’ve always felt that Las Vegas is home to some of the best buffets in the world. 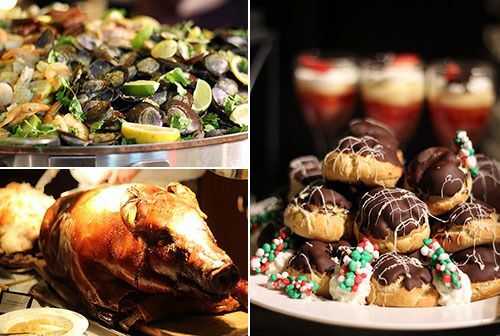 Forget that, the Christmas in November welcome reception is home to the buffet of all buffets. Towers of seafood, plates of charcuterie, a station with melting raclette cheese, and a whole roasted pig were just some of the things being offered that evening. It was a buffet of grand proportions, and all the food was delicious. Check out my recap here! 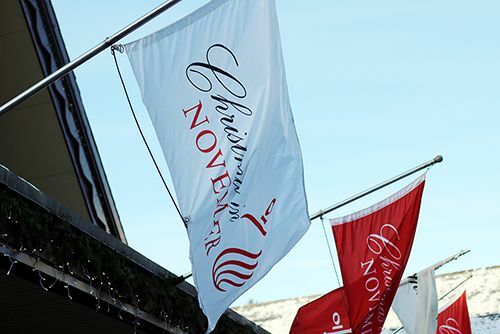 When you register for Christmas in November you are given the opportunity to attend seven sessions. There is also the choice to take a break from sessions to enjoy the amenities on the property (spa, hot tub, etc.) or take the time to explore Jasper and the surrounding area. As I wanted to learn as much as I could, I spent all my sessions with guest presenters, and my first day started with Giselle Courteau, co-owner of Duchess Bake Shop. Duchess Bake Shop is arguably one of the best patisseries in Canada. The shop is well known for the French pastries and macarons, so Giselle spent the morning sharing her passion for the meringue sandwich cookies. I've made macarons in the past and I know how difficult it can be, but Giselle made it look like a breeze. Some of the best things I learned that morning? 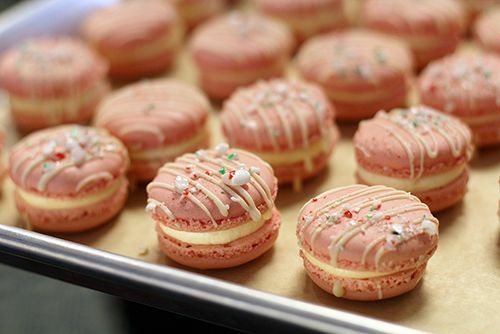 Check out Giselle's tips and recipe to make the best French macarons. 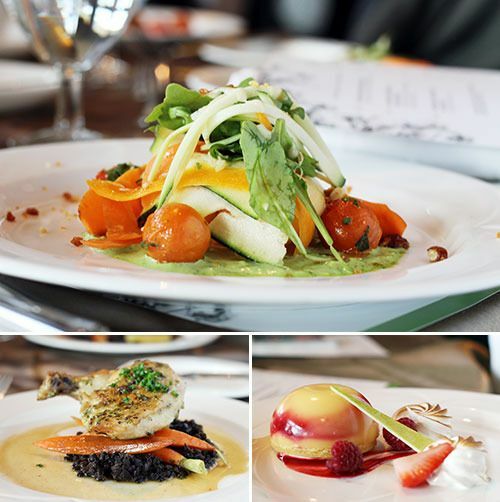 Following the morning session was a three course lunch sponsored by Taste Alberta and the Alberta Turkey Producers. A refreshing salad of beets, goat cheese and citrus came before our main dish of salt brined Alberta free range turkey. 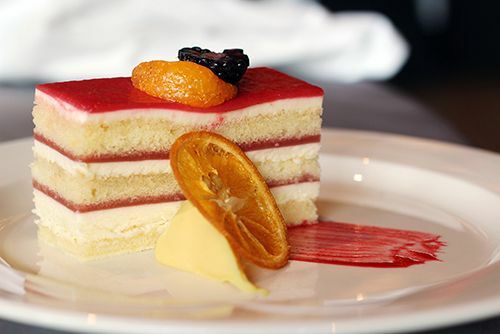 A beautiful slice of strawberry and white chocolate layer cake with orange cremeux rounded off the meal, and although many won't admit to it, I think some of us in the afternoon sessions were affected by the tryptophan in the turkey! The next session of our day was spent with Pierre Lamielle, corporate chef for Subzero and Wolf Appliances. You may recognize Pierre from Top Chef Canada, Chopped Canada, and for his award-winning food illustrations. 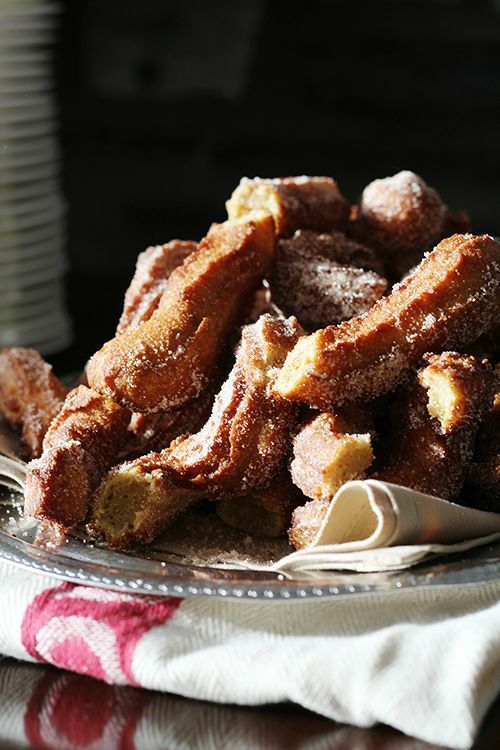 He shared his take on cocktail-inspired desserts, suitably named "Boozy Baked Desserts." 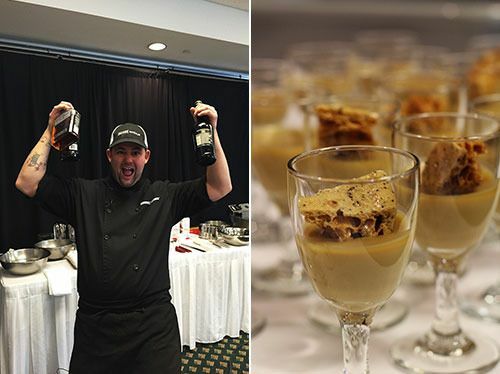 He walked the participants through three desserts inspired by Coffee with Baileys, a Bourbon Old Fashioned, and Sangria. Pierre had a great sense of humour that had everyone hooked onto every word of his presentation. My favourite dessert was the Coffee Pot de Irish Creme, but the bread pudding was a very close second. I'm a sucker for coffee and Bailey's by the fireplace during the winter season, so I'll definitely be making some over the holidays. Check out my recap and the recipes here. For our last session of the day we joined Chef Christine Cushing in making a three course holiday meal. She was personable and you could tell she was really passionate about the food she was cooking. The pairing of Serrano ham and roasted quince was a unique take on prosciutto with melon, and her sweet potato gnudi was a hit! I'm definitely going to try my hand at making her gnudi this holiday season, and you should too. Check out my recap here! Prior to the first formal dinner of the week we attended a private Christmas party hosted by Chefs Anna and Michael Olson where VIP attendees and all the presenters mingled in the Golf Clubhouse kitchen. It was so much fun and surreal to be hanging out casually with so many celebrity chefs, I kept feeling like I needed to pinch myself to decide if I was in reality or a dream! 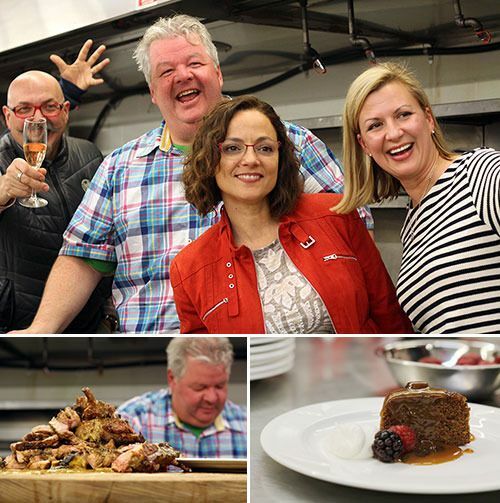 We all enjoyed lamb popsicles, steak, and pork chops cooked perfectly (and in what felt like record time) by Michael Olson, while Anna Olson whipped up a quick caesar salad and sticky toffee pudding for us to enjoy. It was an event to remember, and it was such a conflict figuring out how much to eat, and how much room to save for "real" dinner. The Tuesday evening Holiday dinner consisted of three courses, starting with a potato and leek soup with espelette and truffle essence. Next was a beautiful fall-apart braised short rib served with a bounty of root vegetables. I was about ready to explode as this was our second dinner, but the short rib was too good not to eat. 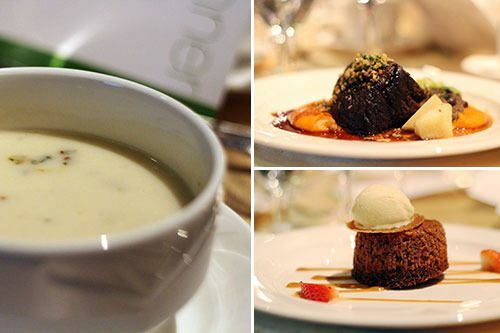 It felt like we had eaten 24/7 and we vowed to pace ourselves a little bit better the next day as we finished the meal with warm sticky toffee pudding. 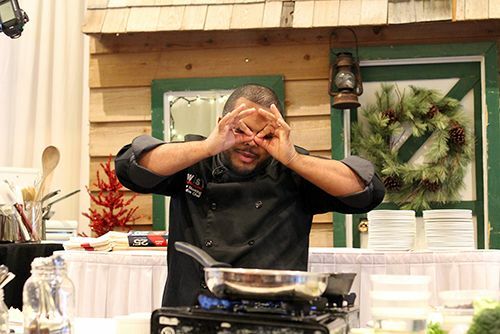 Of all the sessions I attended at Christmas in November, I would rank my session with Roger Mooking as my favourite. As a presenter he was confident, engaging, entertaining, and just a blast to learn from. Check out my notes from the session and grab the recipe! As everyone gathered at the table for lunch, it was a joy to see a beautiful salad to start. Trust me, eating 24/7 makes your palate thankful for refreshing salads! Our second lunch was sponsored by Taste Alberta, Alberta Pulse, and Alberta Chicken. I love that every meal at Christmas in November highlights different producers, as it gives you an appreciation for the food grown in Alberta. Our entree was a Roasted Herb Marinated Chicken Supreme served on a bed of marinated lentils, while dessert featured a delectable tart Raspberry Lemon Dome alongside seasonal berries. While it is great to attend sessions with celebrity chefs, I love that Christmas in November makes the effort to showcase Alberta's culinary talent too. It’s a great opportunity to familiarize yourself with people that are movers and shakers within your local food scene. Our post-lunch session was with Chef Edgar Gutierrez of Rostizado, and he shared his recipe for his delicious Rosti Pollo (roasted chicken), and churros with dulce de leche. Rostizado is a restaurant I frequent in Edmonton, and I’ve always wanted to recreate some of their bold flavours in my kitchen – now I can’t wait to try the recipes at home! Check out my recap and add some Mexican flair to your food. 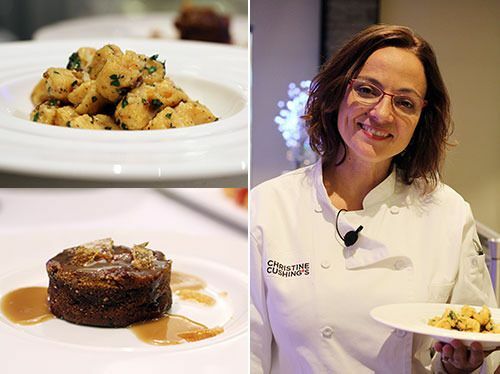 For our final session at Christmas in November we joined Chefs Connie DeSousa and John Jackson, co-owners and co-executive chefs of CHARCUT and Charbar, for a Chopped-style challenge. I've always been a huge fan of their restaurants, so I was excited to see what they had in store! Each chef chose a volunteer to act as sous chef and they battled it out. Connie put together a platter featuring skewers of beef tenderloin and with blue cheese aioli and CHARCUT's famous duck fat fried poutine with truffle gravy. John offered a platter with herb-skewered beef tenderloin with chimichurri and a ceviche-style shrimp with root vegetable chips. 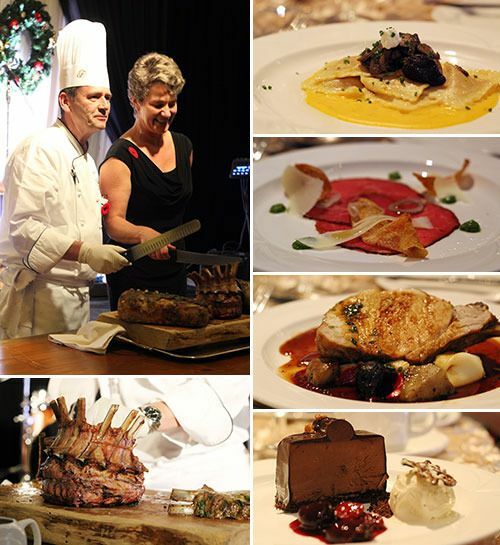 As each team cooked, the room filled with wonderful aromas, and everyone's mouth was watering. So who won? Find out in my recap and grab the recipes! 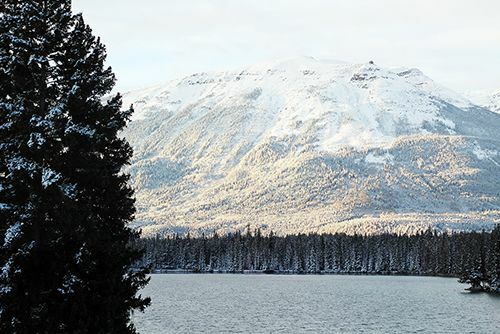 The Jasper Park Lodge hosts a grand Gala Dinner on the last night of each Christmas in November package. The ballroom is transformed into a room dressed with gold trimmings, and everyone is dressed in their best cocktail attire to take pictures with Santa and toast to memories made at the event. The four course dinner began with a beautiful plate of fresh butternut squash ravioli made by ORSO, one of the restaurants on the Fairmont property. Next came a plate of Kobe beef carpaccio, dressed with pickled shallots, fried fingerling potatoes, and smoked parmesan cheese to garnish. As the gala dinner was sponsored by Alberta Pork, a beautiful crown roast of pork was wheeled into the dining room for slicing. The pork was perfectly cooked and seasoned to perfection. A decadent dark chocolate terrine served with Guinness ice cream and morello cherries was a wonderful end to the meal and gave everyone the energy needed to dance the night away. 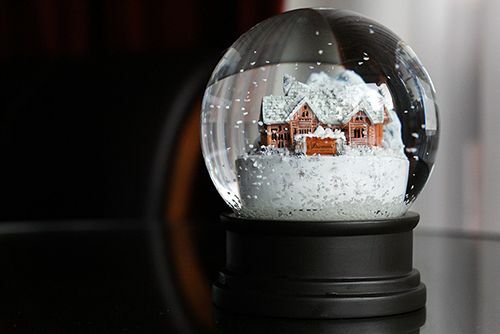 Unfortunately my boyfriend and I had to leave after the gala dinner to return home, cutting our time at Christmas in November just a bit short. Nonetheless, we had been blown away by the hospitality at the Jasper Park Lodge and had an incredible time at Christmas in November. Everything (and I mean everything) feels magical and the time spent learning, eating, and engaging in all things Christmas is a truly special experience. From the moment we stepped foot on the property, to the time that we departed, we were treated like VIPs. If there’s a place that you can expect amazing hospitality and staff that go out of their way to make your stay more enjoyable, it’s at the Fairmont. The days you spend on the property are perfect for a mini-getaway with friends or loved ones, and after this experience I can see why attendees return year after year. I’ve been asked whether Christmas in November is worth the price tag, and I can confidently say yes. Your only task is to relax and enjoy the food, presenters, and the beautiful scenery – everything else is taken care of. My boyfriend and I are already looking forward to attending next year. After all, one of our favourite chefs - Vikram Vij - will be there, and we hope to see you there too. *Disclosure: My boyfriend and I were invited to attend Christmas in November as guests of Gastropost/Postmedia. Views expressed in this post are solely mine. This post is 100% my opinion, and as always, my priority is to you, the reader, to present an unbiased, thorough review. When a restaurant has a popular menu and dishes that customers rave about, it can be hard to make a change to the menu that people love. But with time comes inevitable change, and seasonality of ingredients often dictates what you can and cannot have on a menu. Rostizado is one of the popular Mexican restaurants in the downtown core and was recently a contender for enRoute Magazine's Best New Restaurants for 2015. Rarely is there an evening where the seats in the restaurant are empty, and for good reason: Rostizado houses an upbeat environment and the food is tasty. Good Mexican food can be hard to come by in Edmonton, so when Rostizado asked me to taste some of the dishes on their new menu, I was more than willing! 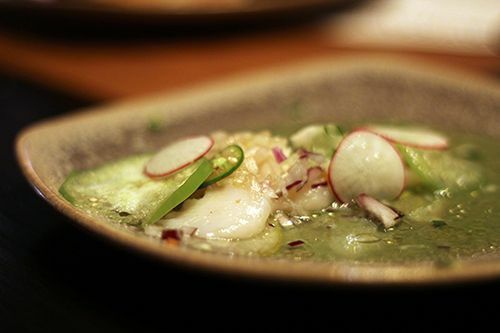 The evening started out with the Scallop Aguachile ($21), where diver scallops were lightly cured and served in a cucumber-lime bath, then topped with a combination of thinly shaved pear, red onions, cucumber, jicama, tomatillo, radish and a light sprinkle of habanero chiles. The fresh scallops had a delicate flavour enhanced by the pear and cucumber, while the other elements offered a crunchy texture. Scooped up onto a tortilla chip, the components work harmoniously to bring a refreshing dish to your palate with a punch of heat. This light dish was my favourite of the evening and I could have eaten just it all night. 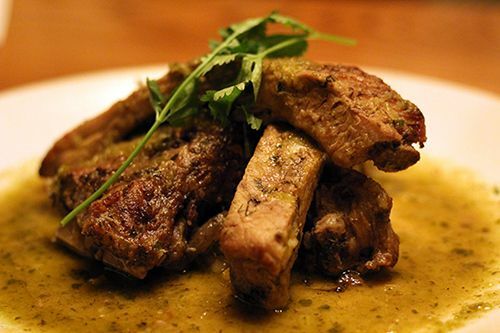 The Costillas en Salsa Verde ($19/gluten free) are a nice change from the typical BBQ ribs that you'll find in Alberta. This substantial dish featured Alberta baby back ribs simmered in salsa verde until tender, and were garnished with pico de gallo. Although the meat didn't fall off the bone, it was flavourful and spicy! Next to the table was the Camarones al Mojo de Ajo ($21), a dish where prawns are sauteed with a generous amount of extra virgin olive oil and lime juice. 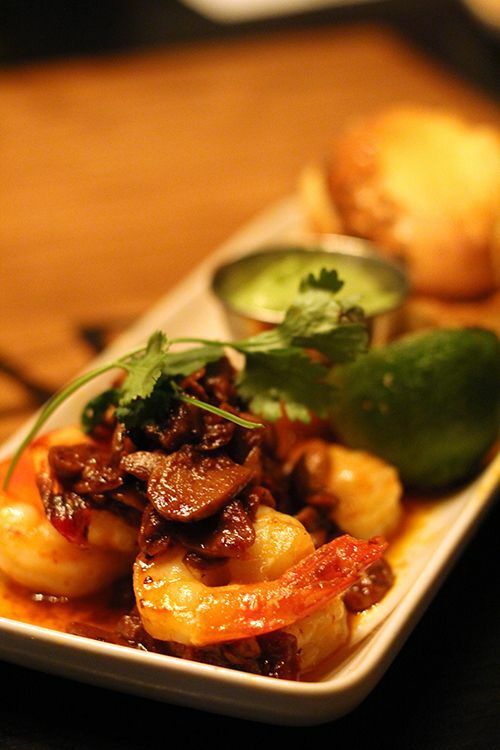 The prawns are then topped with slowly caramelized garlic and toasted guajillo chile. A cucumber-based guacamole is served on the side to cut the heat, and thick cut toast is intended to soak up the rich, fragrant oil. The meaty prawns were spicy and garlicky, and I really loved the refreshing guacamole! The Sope de Rajas ($16/vegetarian) was the most popular dish at the table that evening. 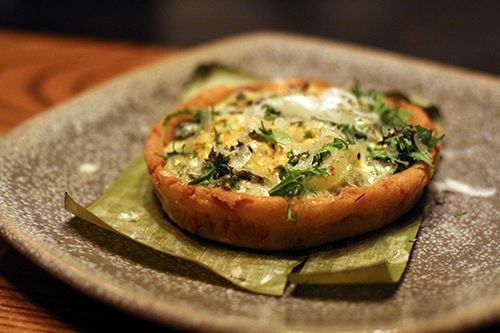 A dough of corn and smoked potato is baked into the shape of a tart and filled with a combination of poblano chiles, onions, butter, kale, and white truffle cream. The raised edges keep all the ingredients in, resulting in a sope that is creamy and decadent. The crust is wonderfully crisp and the heat is strong, but makes you want more and more! 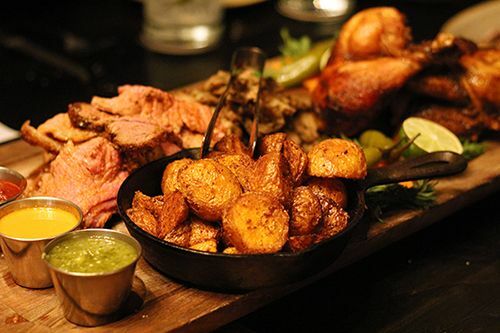 It may just be me, but I believe that every dinner at Rostizado should include a platter of their rotisserie. While the chicken and pork are classics, the new menu is introducing slow roasted Sterling Silver AAA New York striploin to their protein lineup. 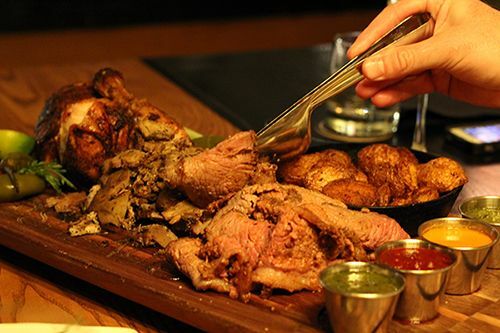 The beef is slow roasted to a beautiful medium rare and is available as an option for all of the platters. As an accompaniment to your meal, Roasted Fennel ($8 Half/$16 Full) is a great side which almost acts as a palate cleanser between bites. 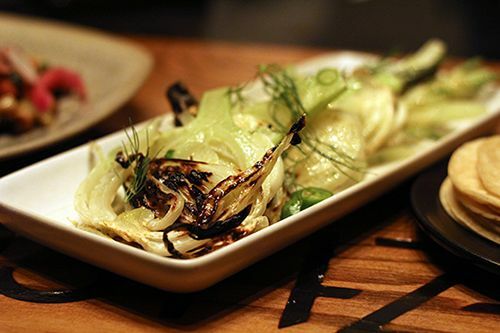 The fennel is grilled on the flat top and served with a honey-serrano glaze, serrano chiles, and olive oil. 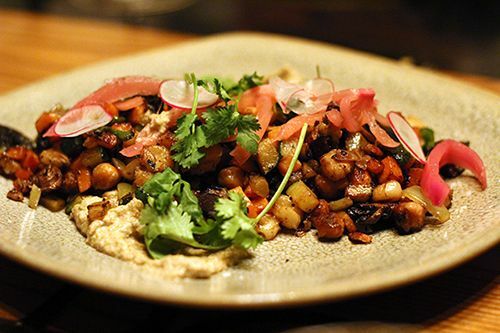 Vegan dishes are uncommon in Mexican cuisine, but after many people have asked for a vegan option, the Vegetables Rostizado ($8 Half/$16 Full) are now on the menu. Roasted portabella mushrooms, zucchini, poblano chiles, garbanzo beans, fennel and onions are roasted and served on Sikil Pak, the Mayan answer to hummus. Sikil Pak is a puree of pumpkin and sesame seeds, roasted tomatoes, fresh habanero, and cilantro. It's smooth, nutty, and creamy like hummus would be. 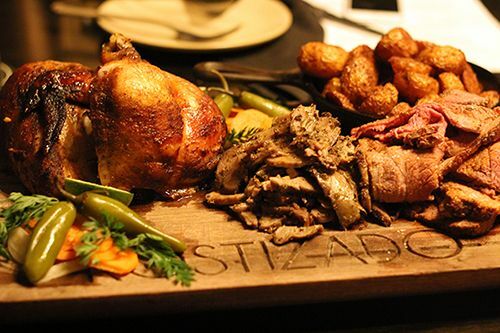 One of the major changes to the Rostizado menu is to the rotisserie platter, which now comes in multiple sizes. The platters can be portioned for groups of 2, 4 or 6, or 1/4 size platters can be ordered for a single person. This is a great change, as I remember the previous platter for 2 being impossible for two people to finish given all the accompanying sides (roasted potatoes, tortillas, pickled veg, salsa). The updated price points for the platters are very reasonable too. Although the churros at Rostizado are a must-have, the new Pastel de Tres Leches ($10) is a strong contender. 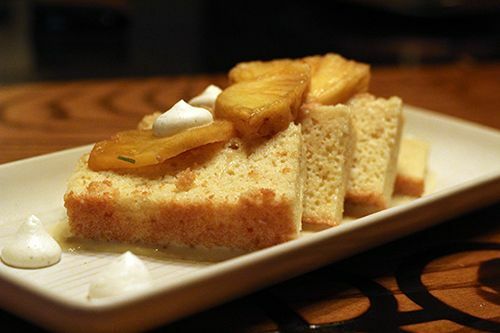 Slices of butter sponge cake are soaked in a mix of three milks: evaporated, half and half, and condensed milk. The resulting cake is rich, moist, and not overly sweet. 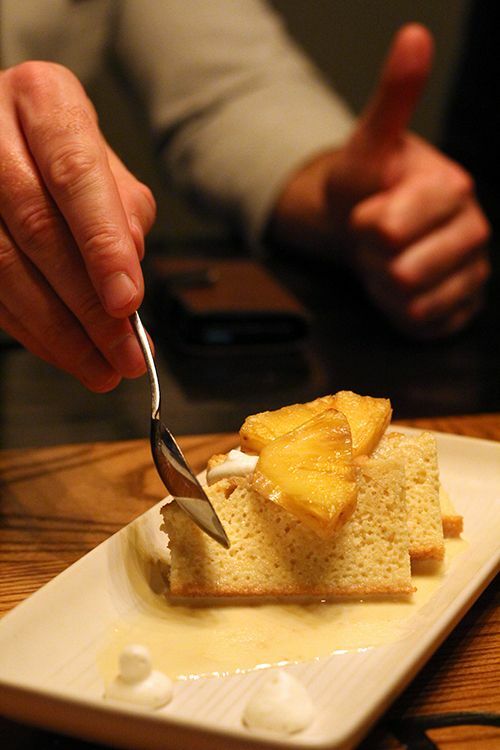 The dessert is made even better by chunks of pineapple soaked in the honey, made specially for their coffee, and dollops of corn ash whipped cream. Although some old favourites have left the Rostizado menu, the new dishes have proven that they were worth the switch. Rostizado continues to bring modern Mexican dishes to the Edmonton food scene and keeps us excited with new flavour combinations. Stop by the Mercer Warehouse for a taste of the new menu - and say hi when you see me eating plates of the scallop aguachile! *Disclosure: I was invited to by Rostizado to sample the new menu. Views expressed in this post are solely mine. This post is 100% my opinion, and as always, my priority is to you, the reader, to present an unbiased, thorough review. Dust off your cowboy hat and slip your feet into those cowboy boots - the Canadian Finals Rodeo is coming to town! Tying in with the CFR, Edmonton will be the home of rodeo week for the next 7 days. 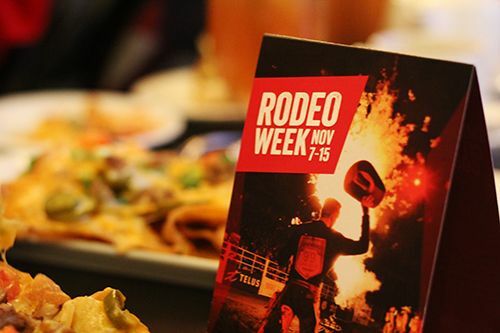 Rodeo Week is here in Edmonton from November 7-15, and even if you aren't attending the main event there are plenty of events going on throughout the city, and 16 different restaurants are offering rodeo-inspired food and drink specials on their menus to celebrate. Since the food scene is going Western for Rodeo Week, I had the opportunity to participate in a food crawl to check out some of the dishes offered by the featured restaurants. The first stop on our tour was at the Sherlock Holmes Pub on Rice Howard Way for their chili - an essential for every cowgirl or cowboy! 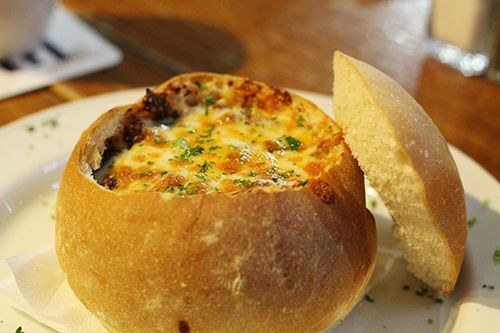 The hearty Colleen's Amber Ale Chili ($14) was served in a sourdough bread bowl and topped with a generous helping of cheese. The chili itself had a great punch of heat, and the substantial portion warmed up our bellies before we headed to our next stop. Next we found ourselves at the Fairmont Hotel MacDonald where the lobby was decked out in Western-inspired decor. One of the great things about Edmonton establishments is their willingness to participate in city-wide events. It really fosters a sense of community and keeps things interesting! 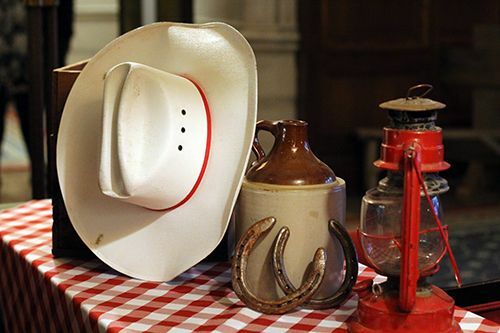 The Confederation Lounge at the Fairmont is offering two different dishes for Rodeo Week. First to the table was the Chorizo Sausage ($21) topped with beef chili, smoked cheddar, and a drizzle of mustard creme fraiche. The sausage was flavourful and had a spicy kick, which could be toned down by the side salad that was dressed with a honey vinaigrette. The second dish was the Asian-inspired Wonton Nachos ($19) that used deep fried wonton wrappers to replace the corn chips typically found in nachos. 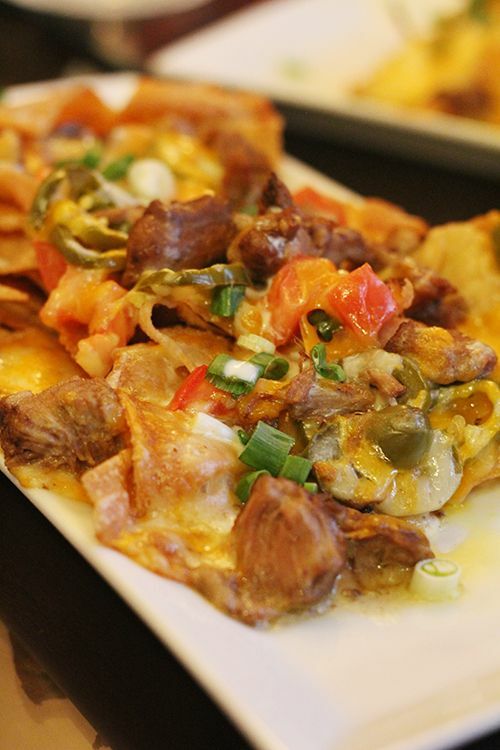 The nachos were topped with chunks of braised pork cheek, scallions, tomatoes, pickled jalapenos, a generous helping a cheese, and a drizzle of wasabi aioli. The wonton crisps offered a lighter crunch than a chip, and when dipped into the accompanying salsa and guacamole, it didn't feel as heavy as a usual serving of nachos. You will want to eat these quick though - those wonton crisps can quickly become soggy as they soak up the moisture from the toppings. 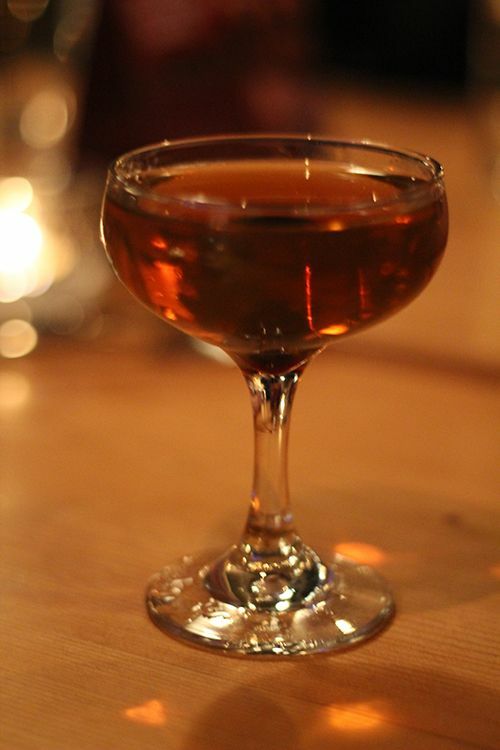 We ended our food crawl with a trip to Woodwork for their Campfire Rambler Cocktail made with High West Campfire Whiskey, Vermouth, and Maraschino liqueur. The cocktail was served in a chilled glass, revealing a single cherry at the bottom of the glass. It was a treat to sip on the cocktail and watch the bartenders work their magic crafting drinks for all the other patrons in the restaurant! 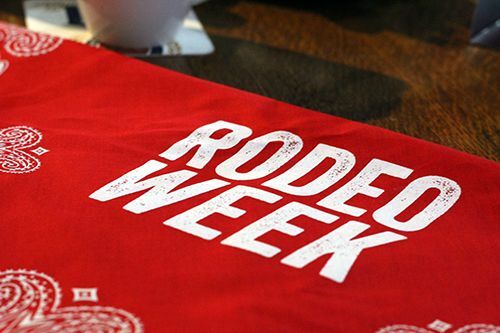 Most of the restaurants participating in Rodeo Week are downtown, but some feature items can be found at establishments outside of the downtown core. 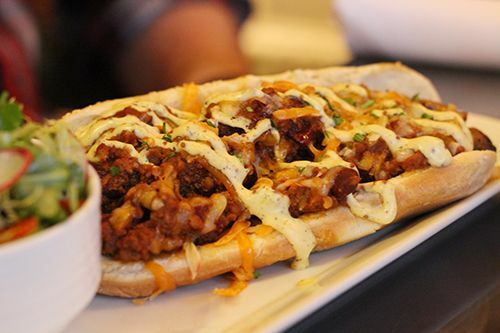 There's a wide range of offerings from stews to sliders to ribs, so there's bound to be a feature that catches your eye! Be sure to take a look at the foods that are the Best of the West and tap into your inner rodeo spirit. Yee-haw! *Disclosure: I was invited to participate in a Rodeo Week food crawl hosted by Edmonton Tourism. Views expressed in this post are solely mine. This post is 100% my opinion, and as always, my priority is to you, the reader, to present an unbiased, thorough review. Roaming through the streets enjoying gelato, followed by indulging in a giant pizza and charcuterie... Oh, what I wouldn't do for a trip to Italy this instant! While I can't get my hands on Italian street food right now, there's a new eatery opening up promising to deliver just that. 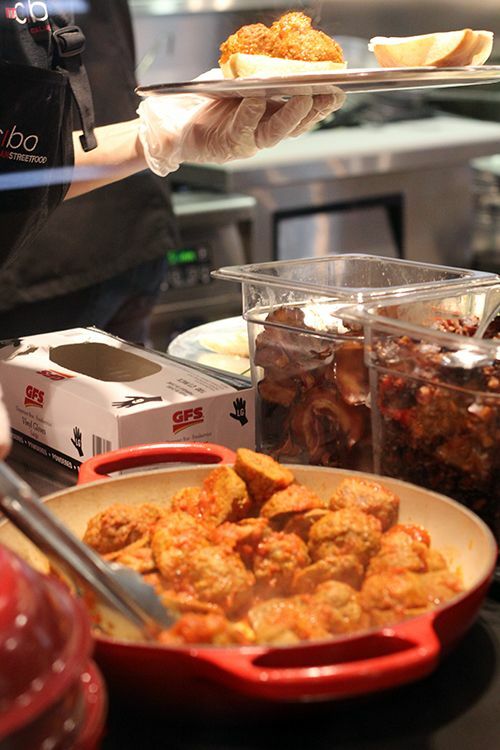 The Crave It Restaurant Group that brought Burger's Priest to Edmonton in March has brought Via Cibo, an Italian fast-casual restaurant, to Sherwood Park. This is the third Via Cibo to open in Canada, with the other two locations being in Calgary and Toronto. The restaurant opened it's doors on November 1st, and I had the opportunity to check it out on opening day. Via Cibo occupies a fairly large space off of the busy Baseline Road in a great location that is easily seen while driving by. The space is clean, modern, and designed to be a quick dining option. As you walk in, you're greeted by the large menu boards behind the counters and a staff member at the register. After placing an order, you are given an order number and lead past the open kitchen to a beverage station before finding a seat in the restaurant. I love this self-lead form of service in casual restaurants, as each experience is tailored to your needs. Whether you're in to grab a quick bite to eat, or planning to spend time sitting down for a longer meal, the servers are available when you need them, and they're not rushing you with constant visits to the table either. To start off our meal we had an order of the Tuscan Fries ($5) which are tossed with a mixture of rosemary, sea salt and truffle oil before being topped with a light shaving of Grana Padano Cheese. 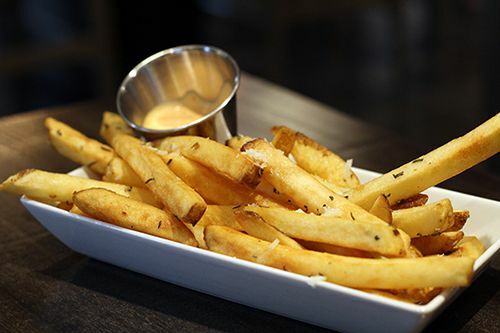 The fries were golden and crisp and the spicy garlic aioli gave the fries a nice punch. Although the rosemary tended to overpower the delicate truffle flavour with most bites, the fries were a nice little snack I would order again. Next to arrive at our table was the Broccolini and Sausage Penne ($14) that was recommended to us by Roxanna Martins, one of the operating partners at this location. All pasta options on the menu (with exception of the gnocchi) can be served with your choice of penne or linguine, and gluten free options are available too. Pasta used at this location is brought in dry from Italy and cooked al dente. 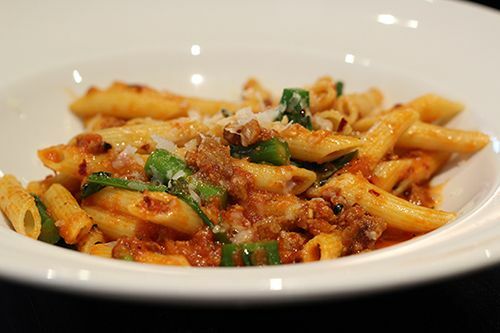 Our dish featured broccolini, house made Italian sausage and the pasta tossed in a chili garlic olive oil, tomato sauce and was topped with Grana Padano. The pasta had a good portion of toppings and was fairly portioned for the price. At Via Cibo all the sandwiches (there are 5 available) are constructed between housemade calabrese bread. We tried the Ossobuco Panino ($14), because who can resist fall of the bone braised veal? 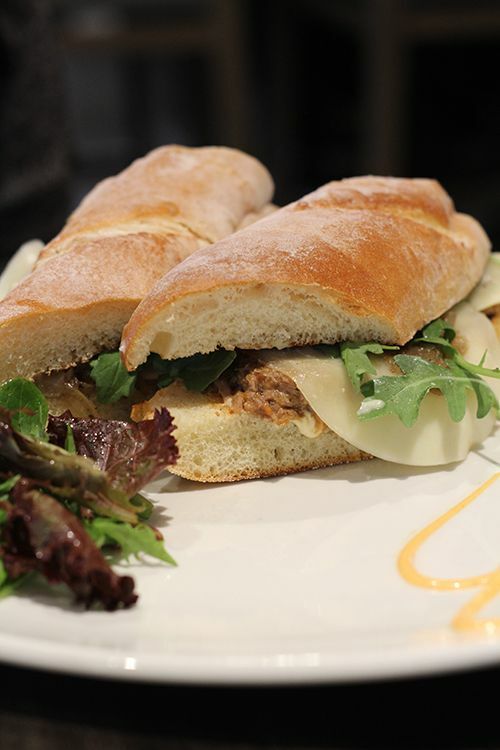 The meat is combined with caramelized onions, arugula, provolone cheese and roasted garlic aioli. The sandwich may not look like much, but the tender meat was well seasoned and gave the sandwich a punch of flavour to contrast the sweet onions. The bread was soft, but I would have preferred for it to be slightly toasted for some added crunch. Last but not least came the Prosciutto E Arugula Pizza ($15). Prosciutto and arugula are two of my favourite toppings on pizza, so I just had to order this one. 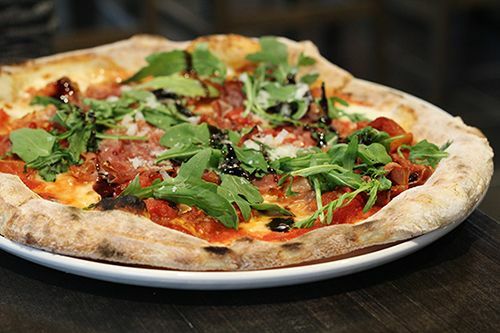 Via Cibo uses prosciutto, arugula, Fior Di Latte, slow roasted tomatoes, Grana Padano and a fig-infused balsamic reduction on their version. While I didn't like that the prosciutto on the pizza was cooked (I prefer mine just cured), there was a fair portion on the pizza along with the other ingredients. The crust to the pizza was thin, but held itself together well structurally, meaning that it didn't fall apart or become mushy from the toppings. According to one of the operating partners, the staff are trained to place a majority of toppings towards the outside of the pizza so as not to put too much moisture or weight on the middle. So that's the trick! The crust was evenly cooked with some blistering, and I would be open to trying some of the other options. 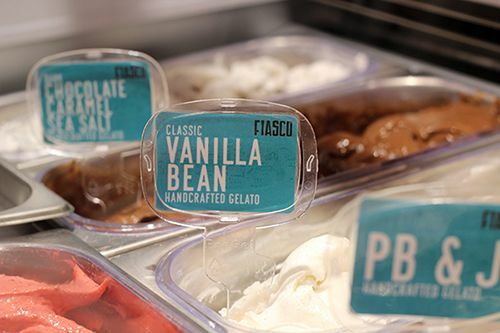 When it comes to sweets, Via Cibo has brought Calgary's Fiasco Gelato on board to offer 10 different gelato flavours to customers after their meals. Flavours will rotate from time to time, and it's great to see that Via Cibo is supporting a great Albertan gelato maker! Throughout the dining experience, I couldn't help but compare Via Cibo to Famoso Neapolitan Pizzeria, an Alberta-based fast casual chain of restaurants. I'm sure many others would come to the same comparison as the dining format and some menu items are similar, even down to the gelato and alcoholic beverage service! While both serve Italian food, there are some distinct differences in their menu offerings and dining environment. I think it will be interesting to see how business will be at both Famoso and Via Cibo, as they are literally down the street from one another! Via Cibo is a great addition to the lineup of dining options out in Sherwood Park, and I'm sure people are welcoming it with open arms! The service was friendly, food came out quickly, and the food was both tasty and affordable. Catering options are available too, so it will be a nice option to change up the usual office lunches! A second location is set to open soon in South Edmonton Common, but in the meantime, stop by the Sherwood Park location for a traditional piadina and a little taste of Italian street food. 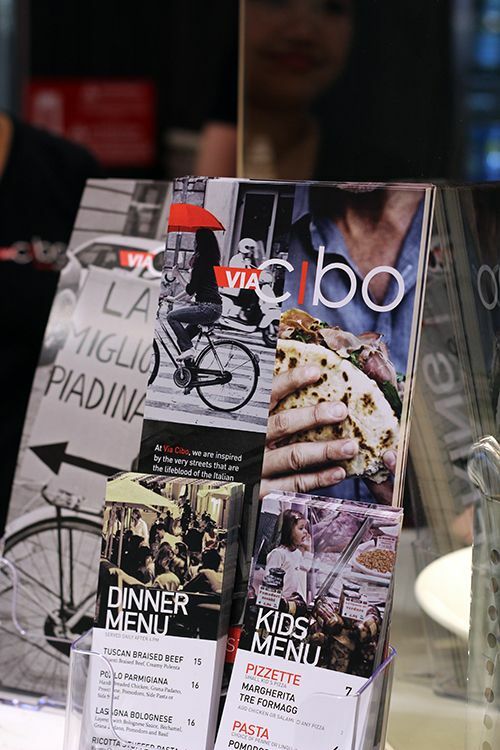 *Disclosure: I was invited to try the Via Cibo on their opening day. Views expressed in this post are solely mine. This post is 100% my opinion, and as always, my priority is to you, the reader, to present an unbiased, thorough review.